Good morning! I've told you about our Christmas trip to Germany (see "Merry Christmas! ", "Christmas Markets in Germany", and "Germany 2018: Wrap Up! 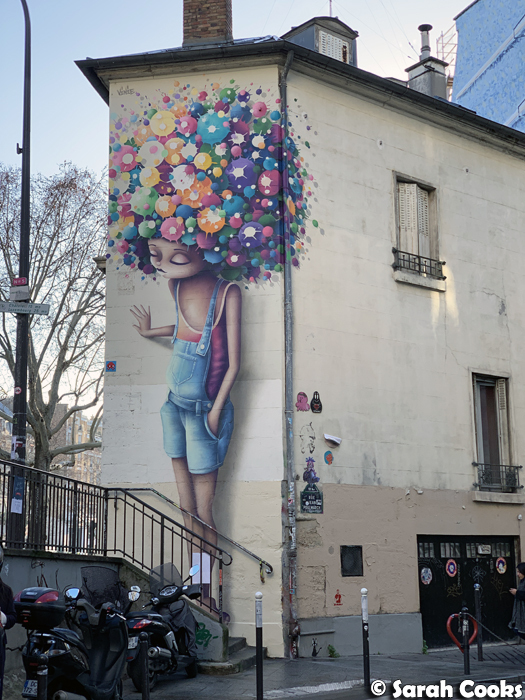 "), and now I want to tell you all about my little side trip to Paris! I spent one night in Paris before Christmas visiting my good friend Clarice and her family, and of course, eating lots of delicious food! I approached this trip slightly differently than usual. 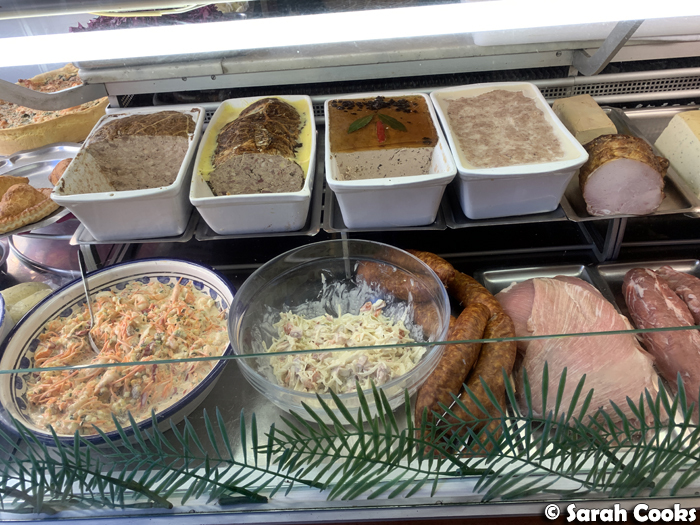 Normally I try to plan my visits in a lot of detail, trying to fit as much foodie goodness in as possible. I attempt to balance new places with old favourites, as well as making sure I purchase lots of goodies to bring back home. However, this time I took it a lot easier, letting in-the-know local Clarice pick where to go. (Thanks Clarice!) 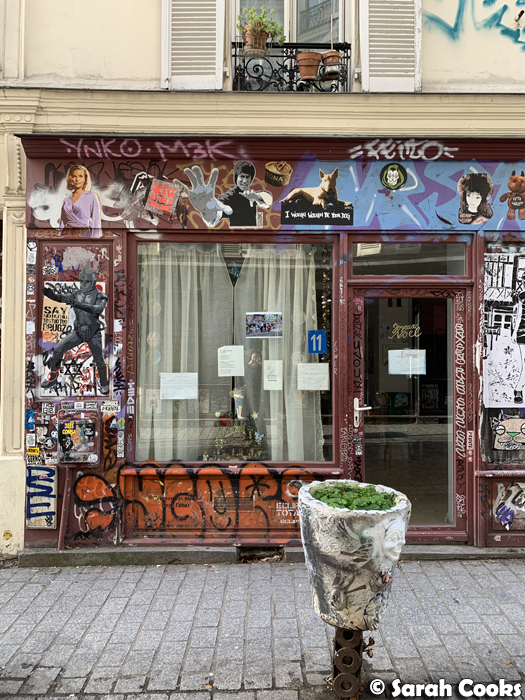 I think that because I'm lucky enough to be able to visit Paris reasonably frequently, I no longer feel that pressure to create an ultimate itinerary and can just leave myself open to new experiences. 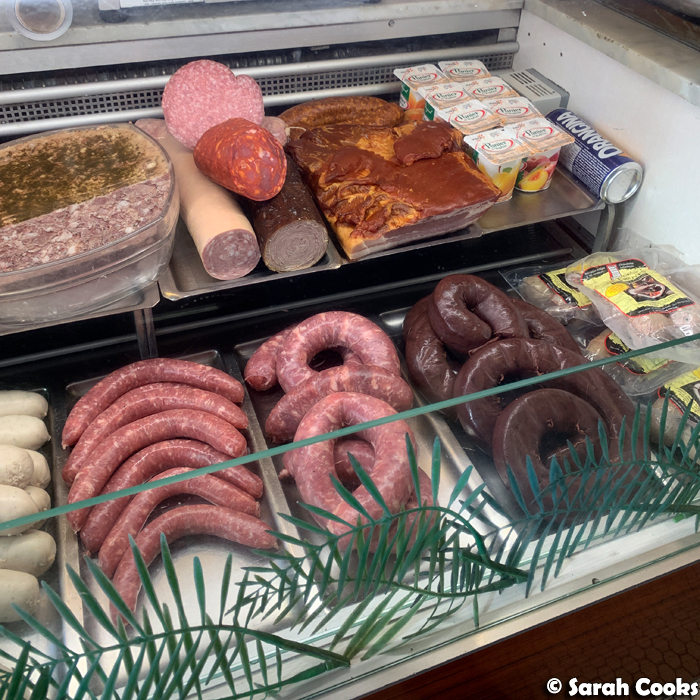 I just went with the flow, purchasing food souvenirs that caught my eye and that I genuinely wanted to eat, rather than anxiously running around trying to work through a list for the sake of it. It was such a lovely trip! It was nice and relaxed, and I got to discover a lot of new places. I am by nature a compulsive planner, so I don't think I'll completely change my approach to travel and holidays, especially for brand new destinations, but it was nice to do it differently this time. So let's get started. As I mentioned in my post about Germany, Clarice had come to Lampertheim to visit, so we took an early train back to Paris together for my visit! 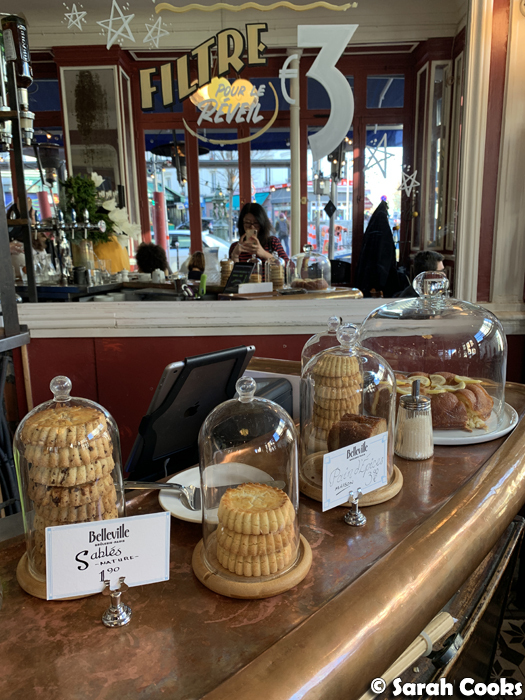 Straight from the train we headed out for breakfast at La Fontaine de Belleville (31-33 Rue Juliette Dodu, 75010 Paris), a modern coffee roaster housed in an old-school Parisian bistro setting. 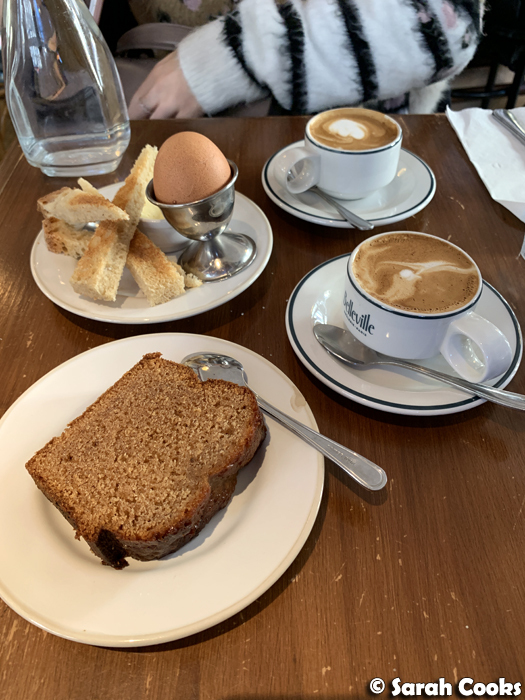 We both enjoyed excellent cafés noisettes (espresso with a little hot milk, similar to an Australian piccolo), with a slice of pain d'épice for me and eggs with soldiers for Clarice. 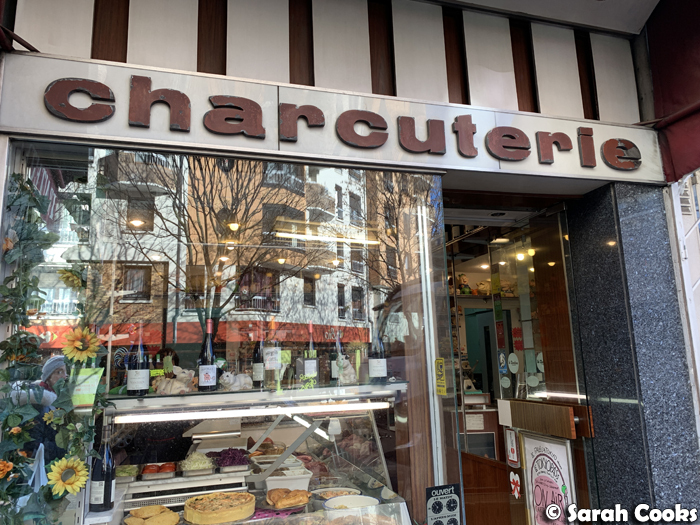 On the way back to Clarice's place, we came across this super cute little charcuterie shop, where we picked up some ham for that night's dinner. 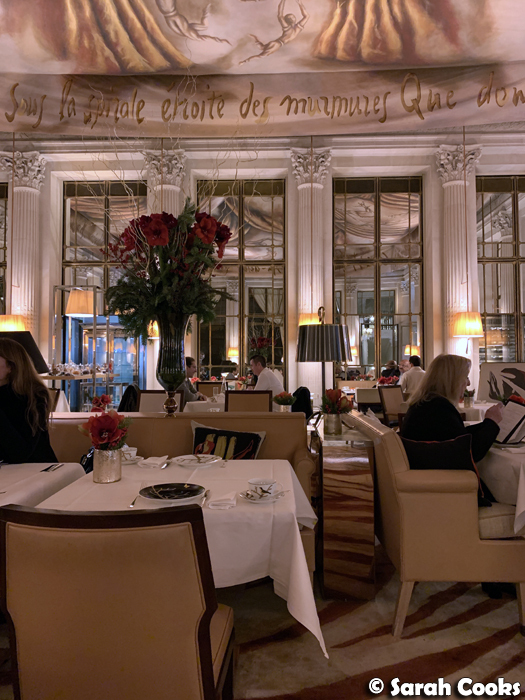 After settling in at home, we headed out for our big blowout meal of the trip - afternoon tea at Restaurant Le Dali, in Le Meurice hotel (228 Rue de Rivoli, 75001 Paris). It was quite the experience! 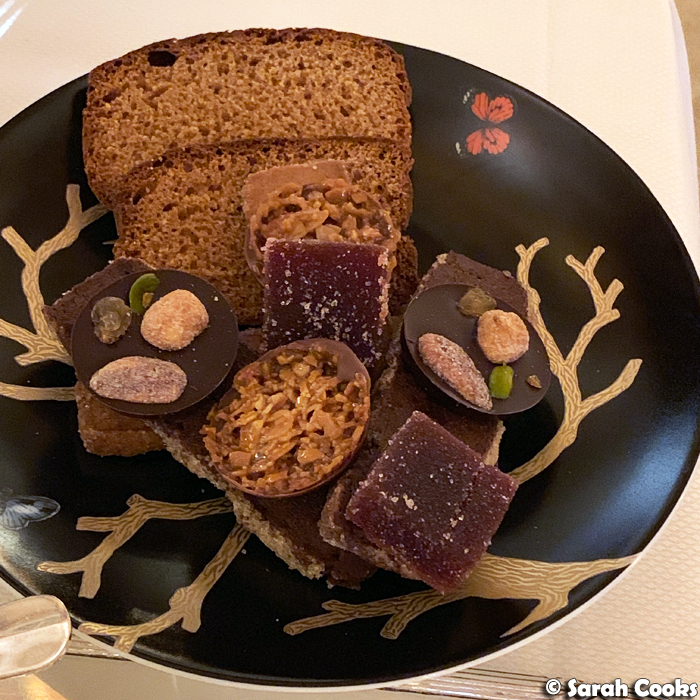 Le Meurice is one of Paris' (and by extension, the world's) most famous luxury hotels, and executive pastry chef at their in-house restaurant is Cédric Grolet, a superstar pastry chef who has been voted world's best pastry chef numerous times. (You can see his amazing creations on his Instagram). 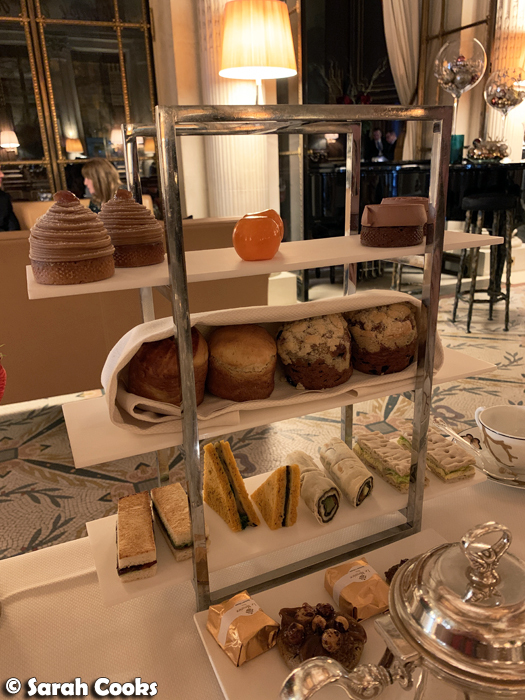 The afternoon tea costs 74€, and comes with tea, coffee or hot chocolate, savoury sandwiches, house made scones, a selection of exquisite pastries, biscuits (Christmas-themed at the time of our visit), cakes and more. It was a ridiculous amount of food, and of exceptional quality. As someone who'd just gotten super-obsessed with Bake Off: The Professionals, I was so excited to be experiencing high-end French pâtisserie! 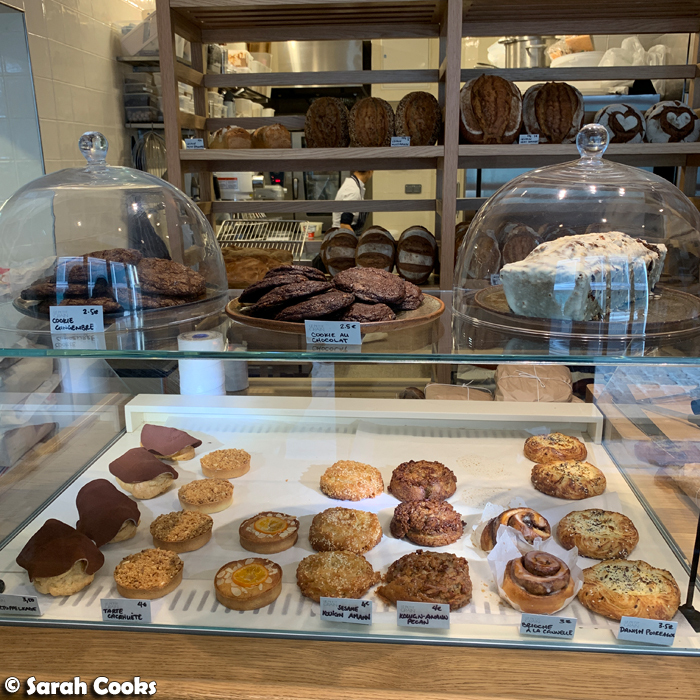 I will write up the tea in more detail in a separate post, but special shout-out for the hazelnut and salted caramel cookie (at the bottom of the above photo), the beef sandwich on toasted pain de mie (far left), and the gorgeous tartlette Mont Blanc (top left). Below we have the "dry Christmas biscuits", which were so much nicer than the name suggests: pain d'épice, mendiants, pâte de fruits, chocolate and vanilla sablés, florentines and more. I'm an absolute biscuit fiend, so I adored this selection! The whole experience was such a treat! The ambience, the service, the food! The two photos above aren't even all of it. Hot tip for anyone doing the afternoon tea: the staff will happily pack up anything you can't eat, and based on what we saw at the tables around us, they expect you to leave food. So don't do what we did and attempt to eat everything at once. We eventually admitted defeat about three quarters of the way through, when we were super full, but also starting to realise that everyone else was getting takeaway boxes. We rolled home clutching our bellies and a box of carefully packed up biscuits and cakes, totally delighted with the experience, but also vowing never to eat sweets again. For dinner that night we stayed in (we could barely move! 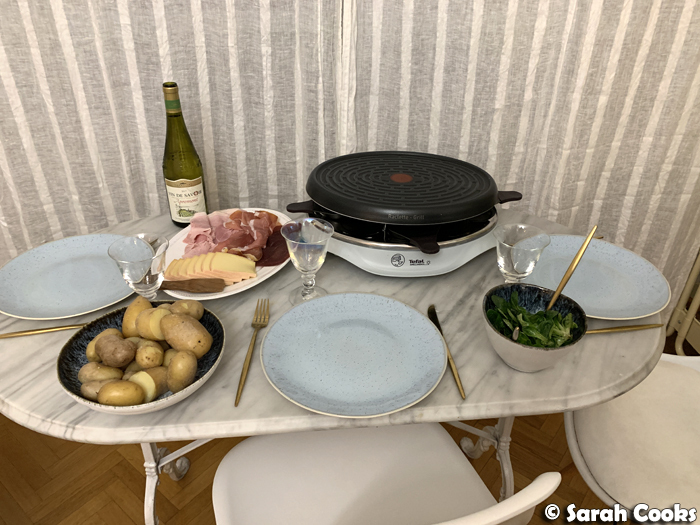 ), and Clarice made raclette. We'd somehow found our appetites again (mine never disappears for very long), and the salty goodness was just what we needed. Our raclette included (of course) the eponymous raclette cheese, bresaola, two types of ham, cornichons, boiled potatoes, and salad. 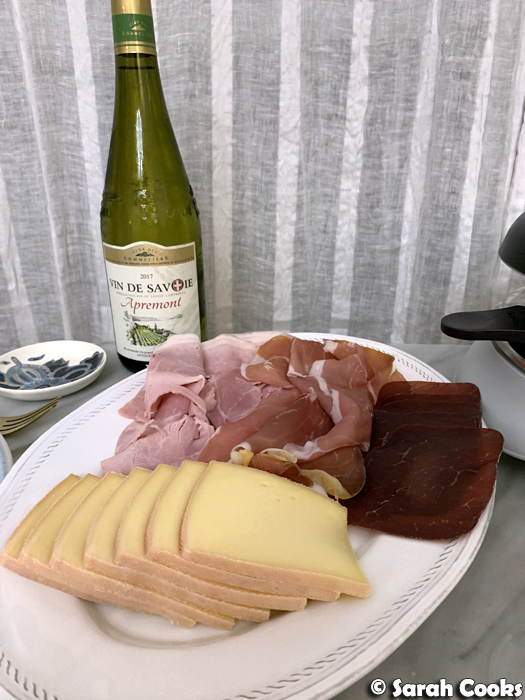 Apparently electric raclette machines are a standard piece of kit in French households, and now I'm thinking I might like one for my Australian household! You place your piece of raclette cheese on the little metal pans with the handle, and place it under the hotplate grill until all bubbly and melty. Meanwhile, you arrange your potatoes and hams on your plate, and pour the melty cheese over it. You can use that little wooden paddle you see next to the cheese in the above photo to help scrape the cheese off the pan. (The wooden paddle is also called "la raclette"). So delicious! And so perfect for dinner on a cold European winter's night! 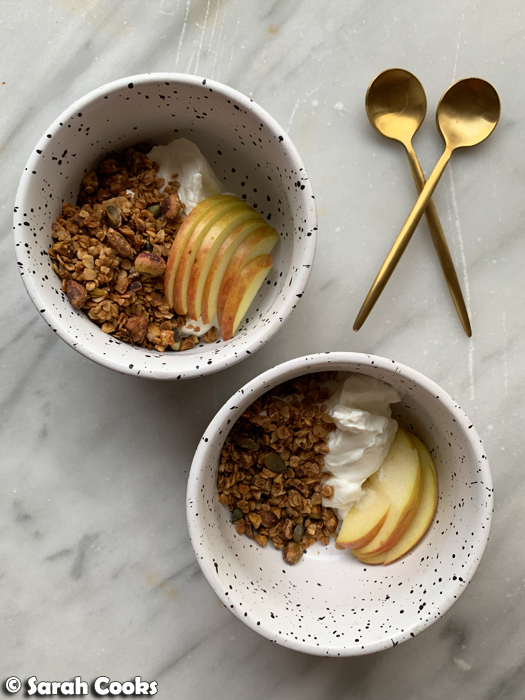 The next morning, we started with a lovely little breakfast at home - Clarice's homemade granola, with thick yogurt and apple. (And coffee, of course). After breakfast we ventured out into town, and shared a small second breakfast at Le Petit Grain (7 Rue Denoyez, Paris 75020). 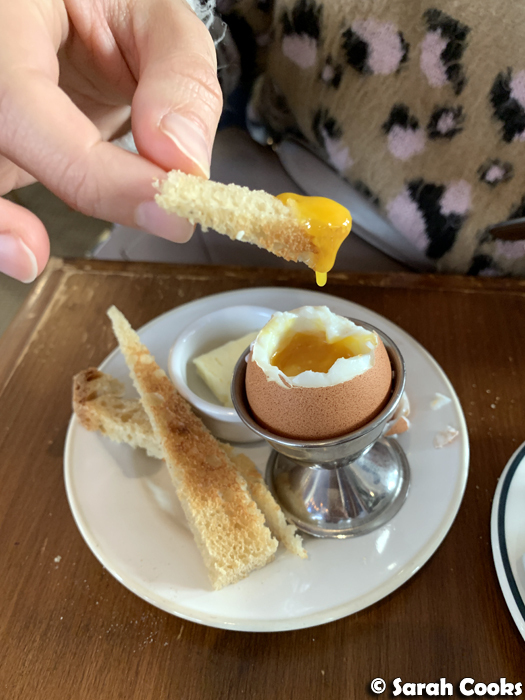 I'd first read about Le Petit Grain on David Lebovitz' blog, and have been following them on Instagram ever since. 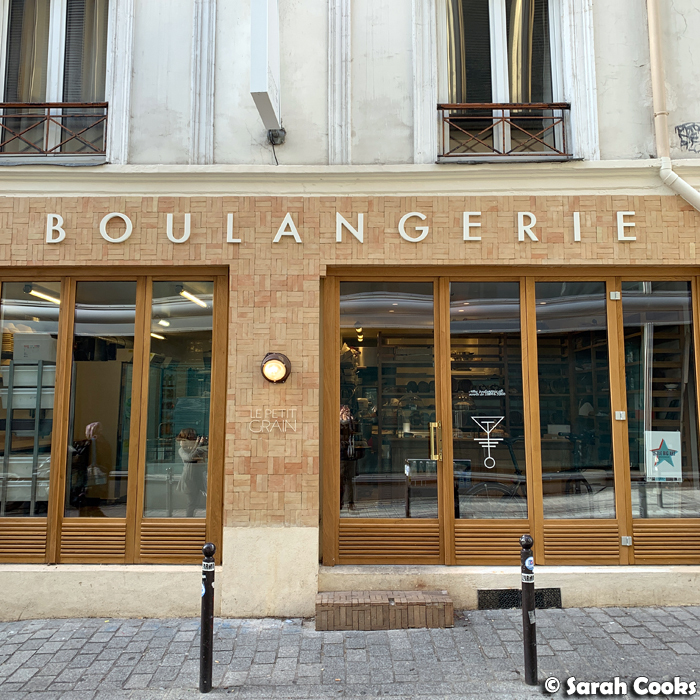 They're a boulangerie that uses natural leavenings in their breads, and who turn out the most delectable-looking pastries! On reflection, I see that their pastries and cookie selection was quite "brown", focusing on dough and pastry and chocolate and nuts, rather than fruits and custards and bright colours. In other words: totally up my alley! I wanted to buy everything in the shop! 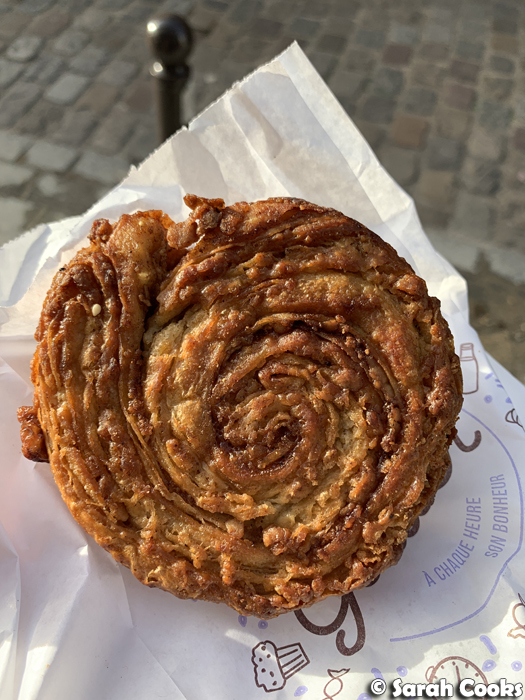 Clarice and I managed to restrain ourselves and just bought one item to share - a pecan Kouign-amann, which, despite being made of dough laminated with layers of butter and sugar, was magically neither greasy nor overly sweet. 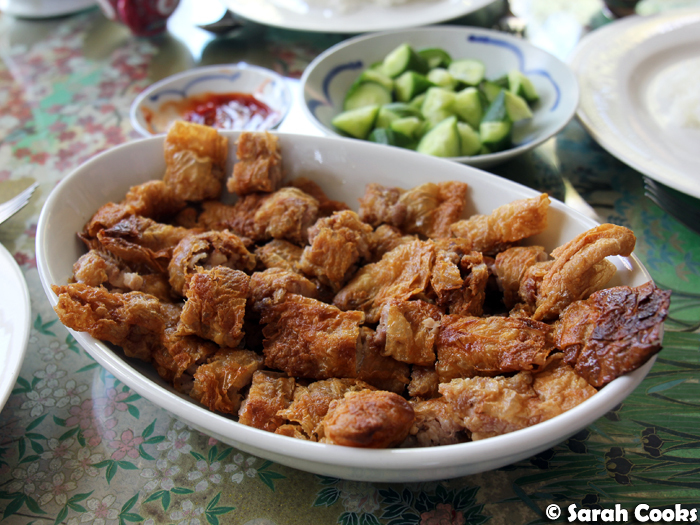 It was crisp and flavourful and just heavenly! If I didn't have a box of takeaway treats from Le Meurice in my suitcase, and German Christmas rapidly approaching, I would have definitely bought some cookies home with me. Next time! ...and stumbled across the Belleville market. 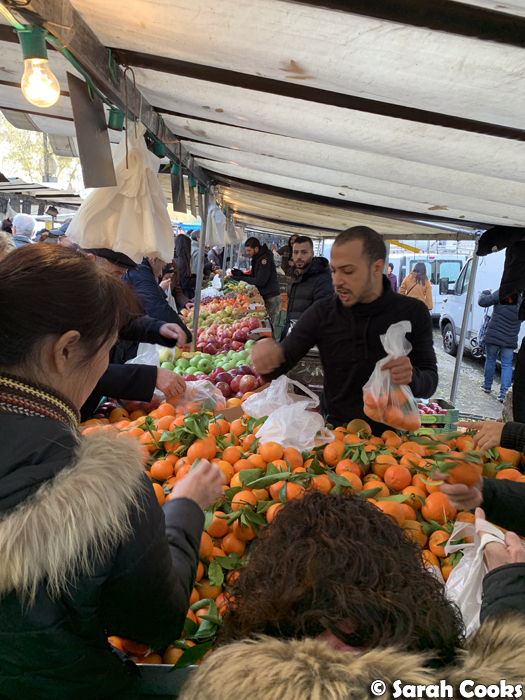 The Belleville area is very multicultural, with significant Chinese and North African populations, and the market stocks a really wide variety of ingredients. 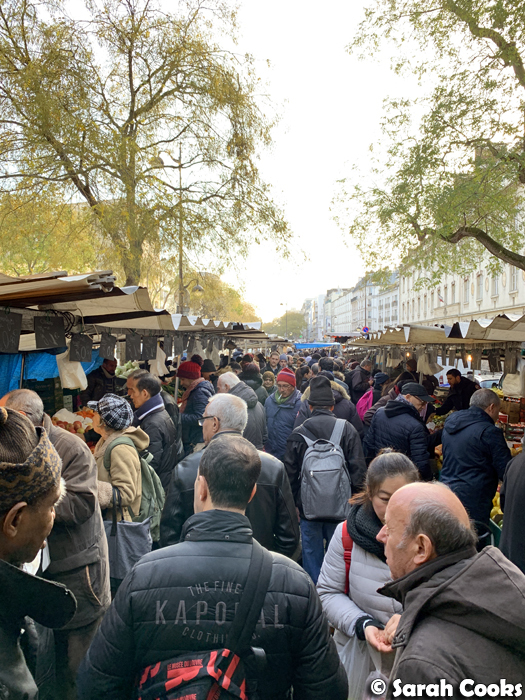 It was also incredibly busy even on a Tuesday morning! 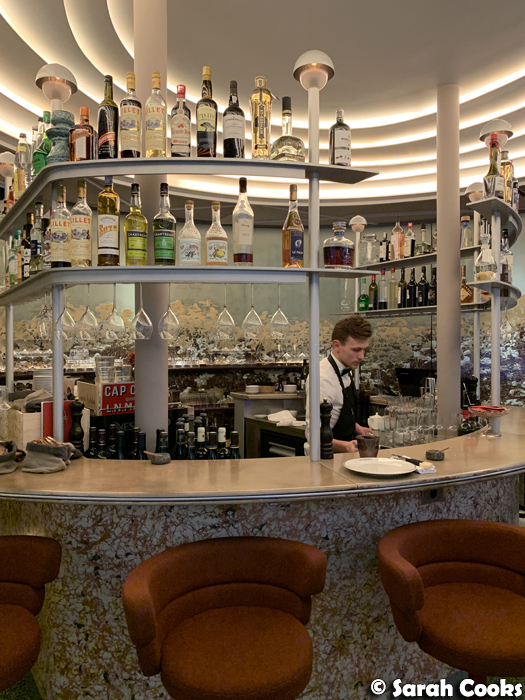 For lunch, we went to Astair (19 Passage des Panoramas, 75002 Paris), a beautiful brasserie in the Passage de Panoramas. They do an incredibly well priced weekday lunch special, three courses for 25€. I loved the meal so much that I'm going to dedicate a separate post to it. But for now: some highlights. 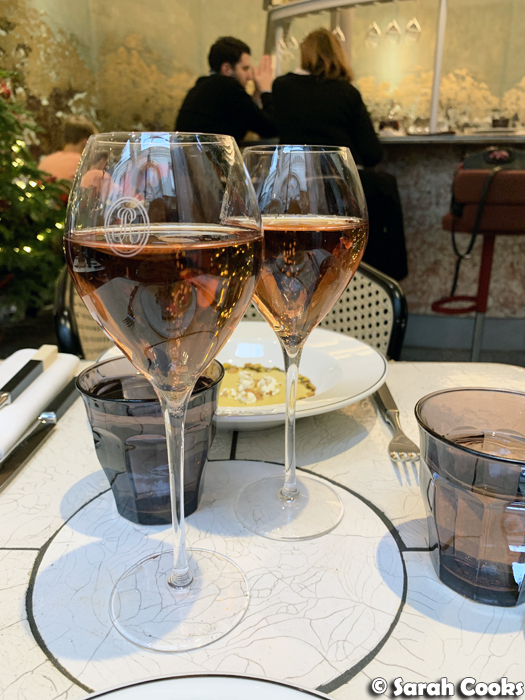 Starting with rosé Champagne because we are fabulous ladies and why the heck not! Clarice's main of rascasse fillet, with glazed carrots and coriander coulis. 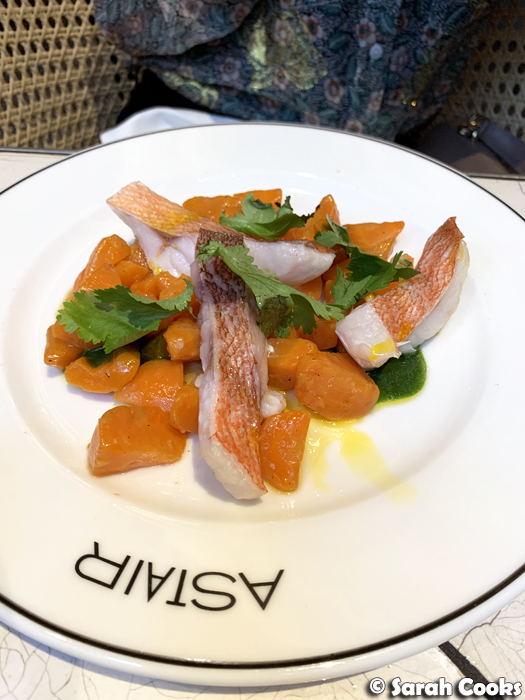 (Rascasse is also known as "scorpion fish", and is the main ingredient in the famed Provençal fish stew bouillabaise). For desserts, we splashed out and ordered off the regular menu. 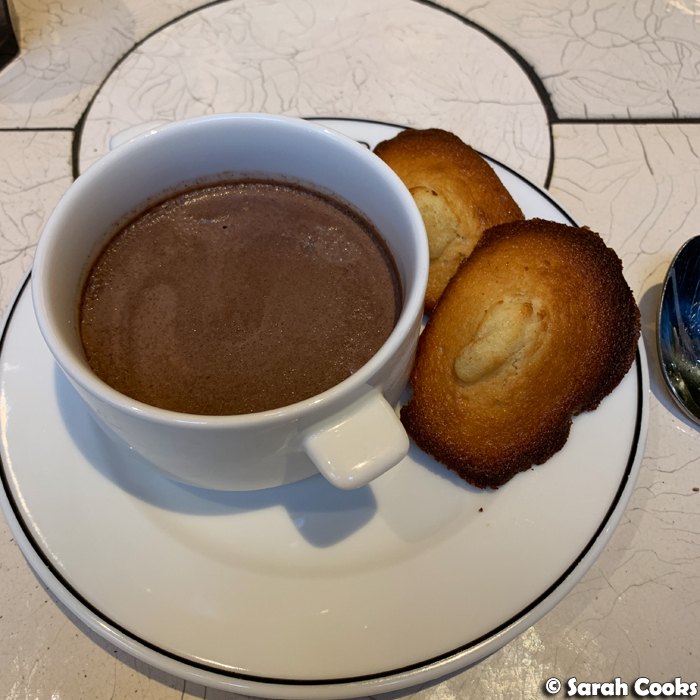 I ordered freshly baked madeleines with a pot au chocolat, and it was an absolute delight! I love madeleines, and bake them at home often. These were gorgeous, all warm and buttery and crisp on the edges. I loved dipping them in the rich chocolate. One hundred percent stealing this idea for future dinner parties. 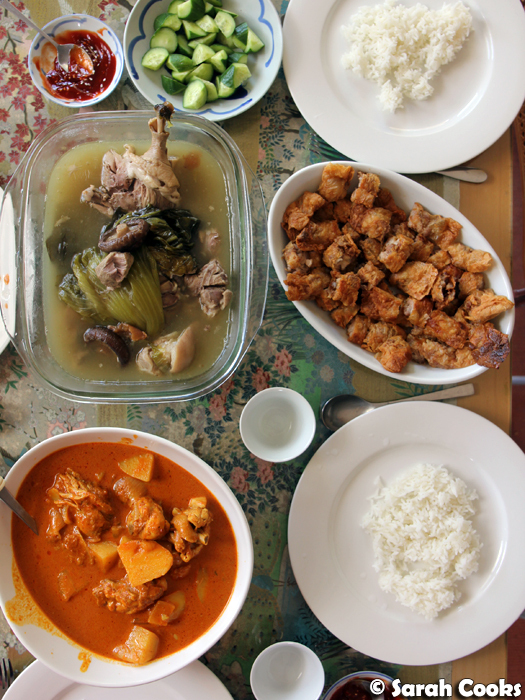 Remainder of the meal to come in a future post, but for now suffice it to say that it was an excellent choice for lunch. The atmosphere was cozy and bustling, but still felt special and modern, and of course, the food was wonderful. 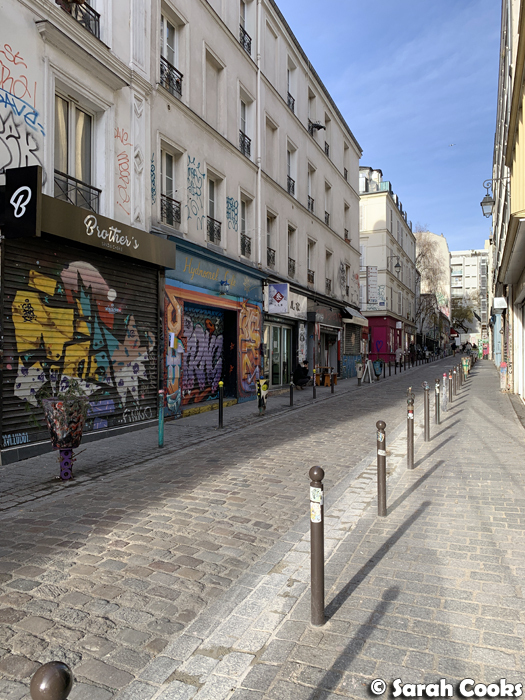 That afternoon we did a bit of shopping on the Champs-Élysées (sounds fancy to Australians but there are lots of normal stores there too, not just high-end boutiques). I got some scented candles from Zara Home (I'm not into Zara clothes, but I LOVE Zara Home) for my sister-in-law as a thank-you for hosting our wedding tea, and some other bits and pieces. And then we had a pit-stop at the Pierre Hermé & L'Occitane concept store (86 Avenue des Champs-Élysées, 75008 Paris). I am a fan of both Pierre Hermé and L'Occitane, and have quite a few items from their collaboration - I particularly like the soaps and hand creams in both grapefruit rhubarb, and jasmine imortelle neroli. The concept store stocks L'Occitane products, sells pastries and macarons, and has a salon de thé. It's a beautiful space. 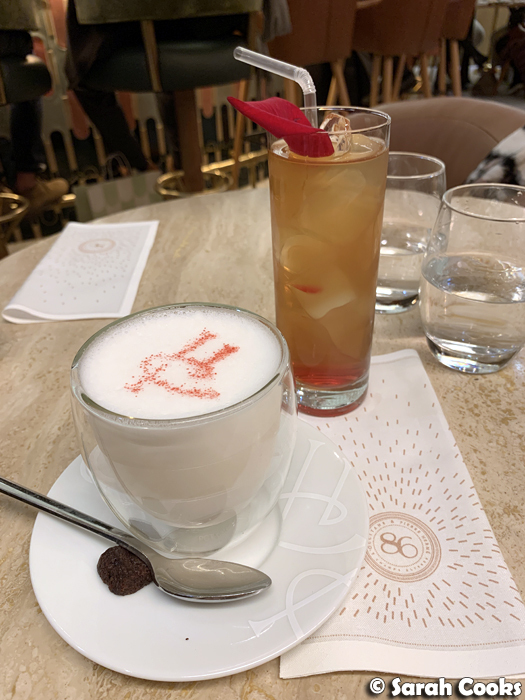 We were way too full to order any pastries, but both enjoyed a drink each - an Ispahan latté for Clarice, and an Ispahan iced tea for me. I love the beautiful red rose petal adorning the iced tea! (PS for those of you who don't know, Ispahan is one of Pierre Hermé's signature flavour combinations, of rose, raspberry and lychee). We did ogle the menu though, and I was thrilled to see that they serve a dessert called the "Sarah" - passionfruit crème brûlée with ice-cream and passionfruit tuile, chestnut jelly and a rich matcha cream. It sounds perrrrrfect for me and not just because of the name. I will have to save some stomach space and order it next time! 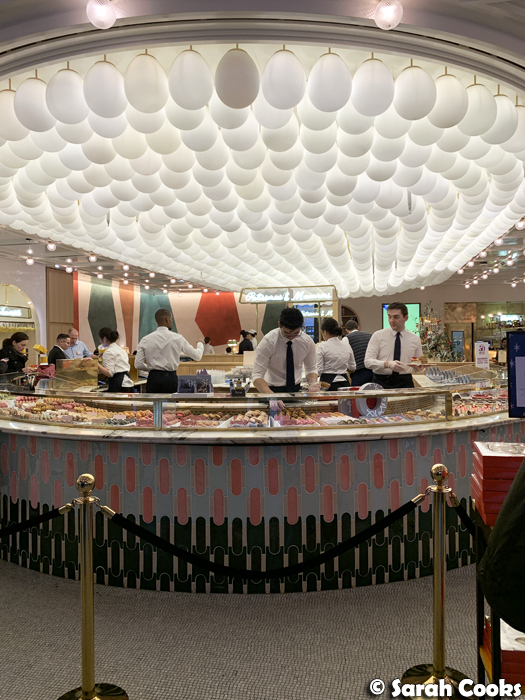 However, I think it was testament to the quality and quantity of excellent food that we ate over the trip, that I couldn't face ordering a Pierre Hermé pastry, or even consider purchasing any macarons to bring home. And from there it was back to Germany! The visit to Paris was short but (very) sweet! Thank-you Clarice for being an excellent host and tour guide! 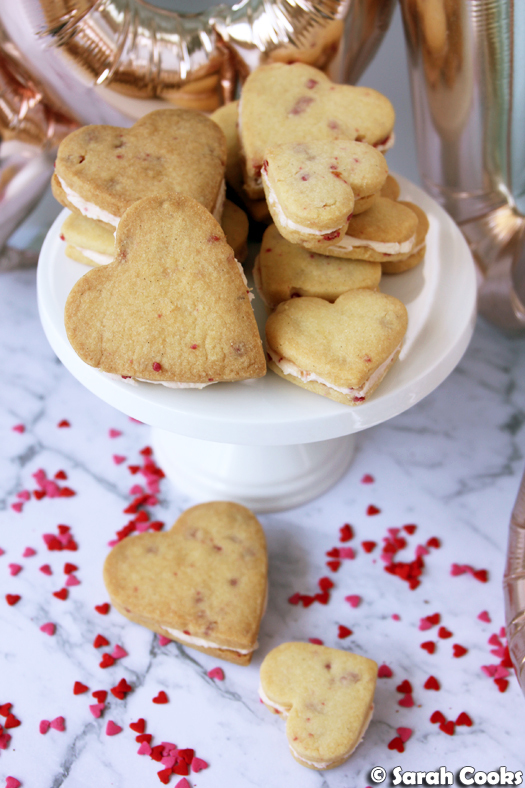 Rose and strawberry shortbread hearts. These are incredibly buttery and crisp shortbread biscuits, studded with beautiful crunchy crystallised roses, and sandwiched together with a strawberry buttercream. Total cuteness overload! 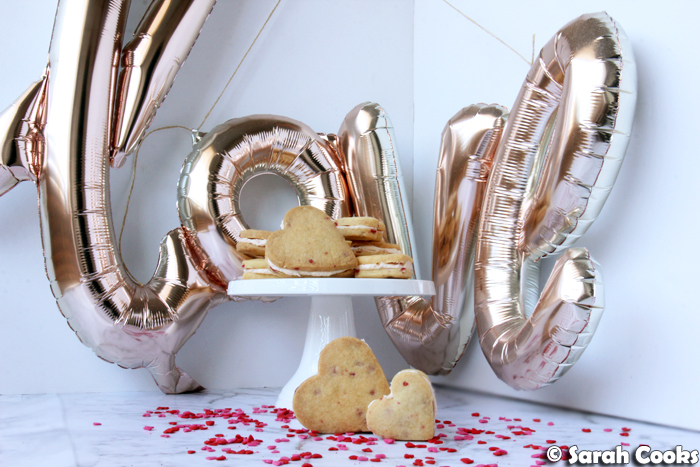 I like to think that I'm too cool for Valentine's Day, but I can't resist a heart shaped cake or biscuit! And whilst I don't have much interest in the expensive, commercialised aspects of this "holiday", I think it's nice to have the excuse to do something thoughtful for a loved one, or to have a Galentine's Day catch-up with close friends, or to make something cute. Case in point: the chicken nugget bouquet of 2017, perhaps my greatest Valentine's Day achievement so far. But let's get back to the biscuits! 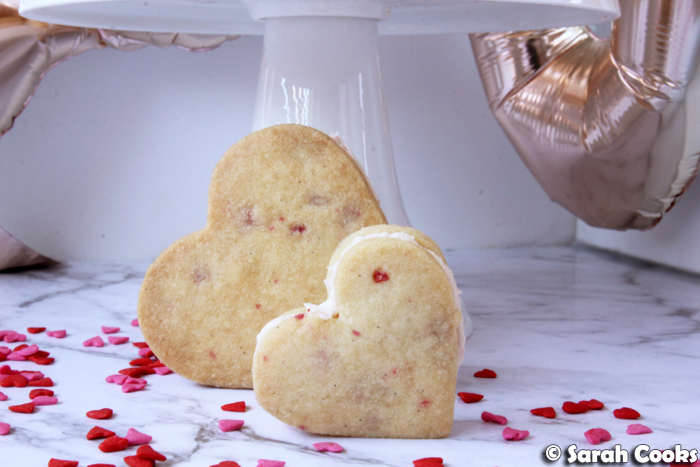 These rose and strawberry shortbread hearts sound fancy but are actually quite simple to make, albeit with a little specialised shopping involved. The biscuit component of these is a basic shortbread, with some crystallised roses folded through. (Those are the pretty pink specks!) The buttercream is a classic American-style buttercream (i.e. butter and icing sugar), with some freeze-dried strawberries added for a pretty pink colour and a pure strawberry flavour. 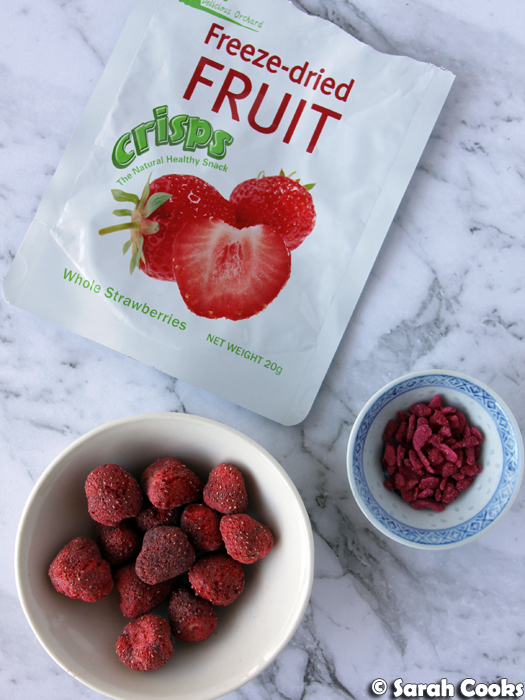 I got the freeze-dried strawberries at an Asian supermarket. The crystallised roses were actually a gift from a friend (Hi Clarice! ), although I have seen them at speciality baking stores in Melbourne, and a quick Google search tells me that they can be purchased online in Australia as well. The crystallised roses provided a beautiful colour and a lovely crunch to the shortbread, but not much in the way of fragrance or flavour. (Which is fine, I basically wanted them just for the colour and texture!) I don't know much about crystallised roses, and they had been sitting patiently in my pantry for quite some time (*ahem*... a decade), so I'm not sure if they're always mild like that, or if fresher ones or different brands might have a strong rose scent. I know that rose can be a divisive flavour - if you do go ahead and make this recipe, I'd suggest having a sniff of the crystallised roses first, and if you find them quite strong, simply use less. They're soooo pretty though! I love the deep pink flecks throughout the dough. I have been watching a LOT of Great British Bake Off recently, so I was really pleased that the hearts all came out the same size and shape, and with a reasonably even colour. For the buttercream, I whizzed the strawberries into a fine powder, and then added that to the buttercream mixture. Look at that light pink blush! Gorgeous. And then it was just a matter of sandwiching them together. You'll see I made both large and small hearts. 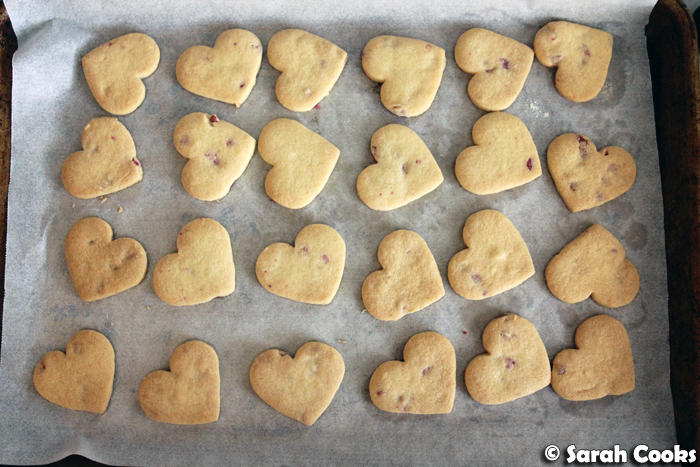 In the recipe below, I've written that these quantities will make approximately 24 sandwich biscuit hearts (i.e. 48 single hearts), but this will depend on the size of the cutters you have. The eagle-eyed among you might recognise these as the heart cutters from the cookie cutter set from Nigella's now-defunct Living Kitchen range. I remember back in 2004 us Nigella fans were OBSESSED with this range and would spend loads on these egg-shaped powder blue and cream items. 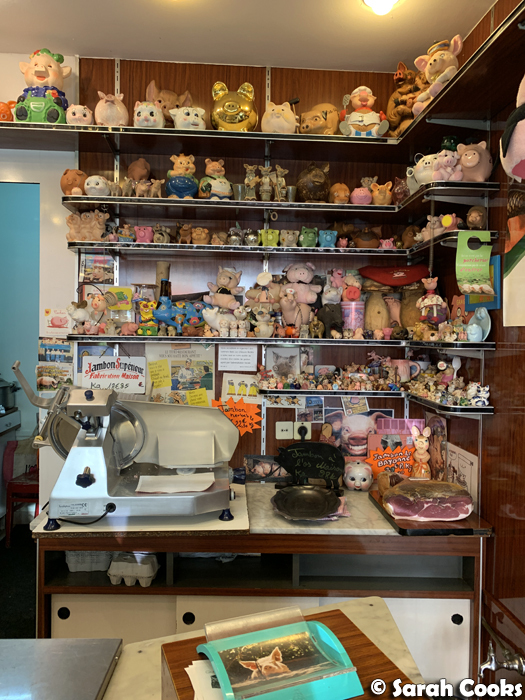 I still have quite a lot of the items - salt pig, cake dome, giant egg-shaped platters, ice-cream bowls, springform tins, salt and pepper piglets, storage jars. Although they're all very pretty and many have lasted well, with the benefit of hindsight I can admit they were all overpriced and there were some items in the range that were of poor quality. 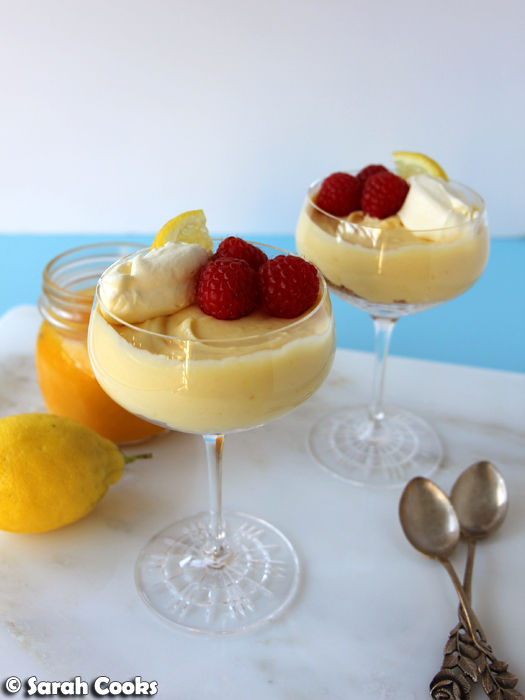 I remember having to return the mixing bowls because they developed cracks in the glaze after the first couple of uses, and a mini whisk went rusty quickly. (I also remember a lot of chatter on the Nigella.com forum about metal implements rusting). But, on a more positive note, I am pleased to say the cookie cutters have lasted. And speaking of sturdy items, the biscuits were pleasingly sturdy too - not a single one broke as I was icing them. But they're not hard or unpleasant; they're crisp and delicate and melt on the tongue. A few variations and notes. Crystallised roses are hard to come by, so if you can't find them this shortbread is still well worth making. It's crisp and buttery and delicious! With or without the crystallised roses, the shortbread also stands up on its own, so you can skip the icing if you prefer. (Indeed, I'll be using this recipe as my base shortbread recipe from now on, I loved it that much). The icing is on the sweet side, but I think that's appropriate for Valentine's Day. You may have some icing leftover, depending on how thickly you spread the frosting. 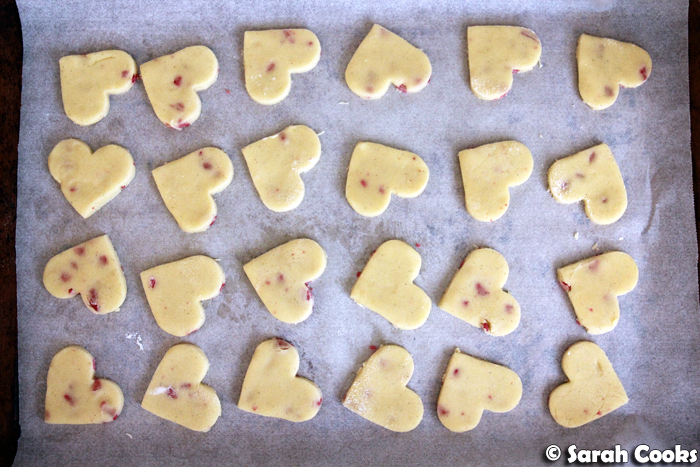 These shortbread hearts were so cute and so delicious! I loved the gentle pink colour, the delicate texture of the biscuits and the soft icing, the lovely crunch from the pretty crystallised roses, and the sweet strawberry fragrance in the icing. They were so fun to bake and eat too! Happy Valentine's Day! To make the biscuits, beat the butter and sugar in a free-standing mixer until light and fluffy, approximately 5 minutes. Add the vanilla extract and beat for another minute or so. With the mixer on low, add the flour 1/2 cup at a time. Add the cornflour, and mix until combined. Add the crystallised roses and beat on low until combined. 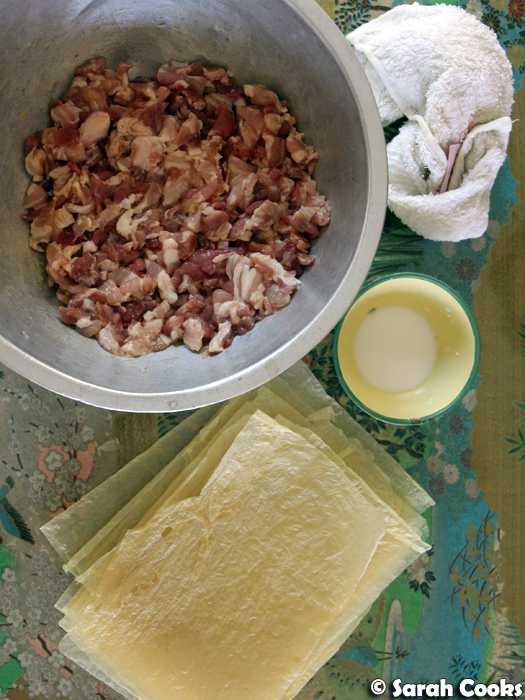 Turn the dough out onto a surface and form into a fat disc. 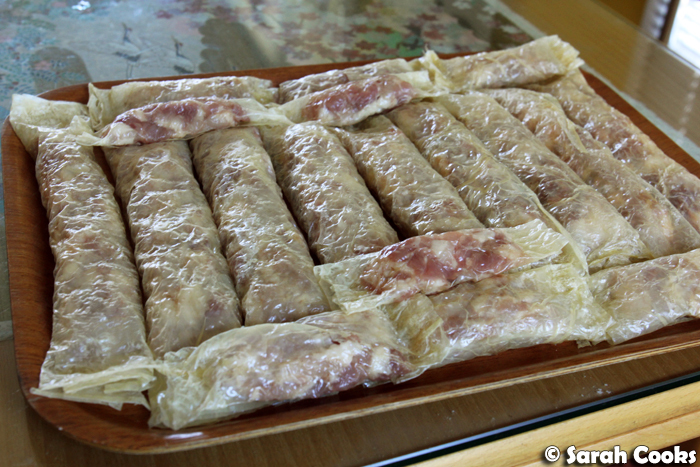 Wrap in clingfilm and refrigerate for 30 minutes. Preheat the oven to 150C and line a baking tray with baking paper. Roll out the dough on a floured surface to approximately half a centimetre thick. (I like to use half the dough at a time, keeping the other half in the fridge). 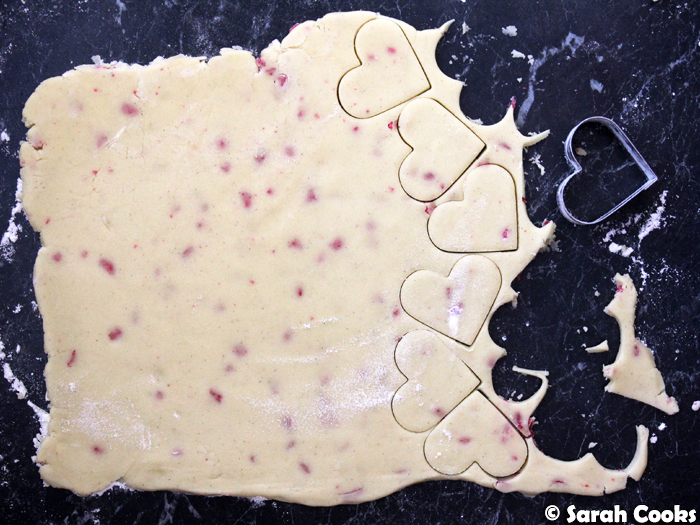 Cut the dough out using a heart shaped cutter. 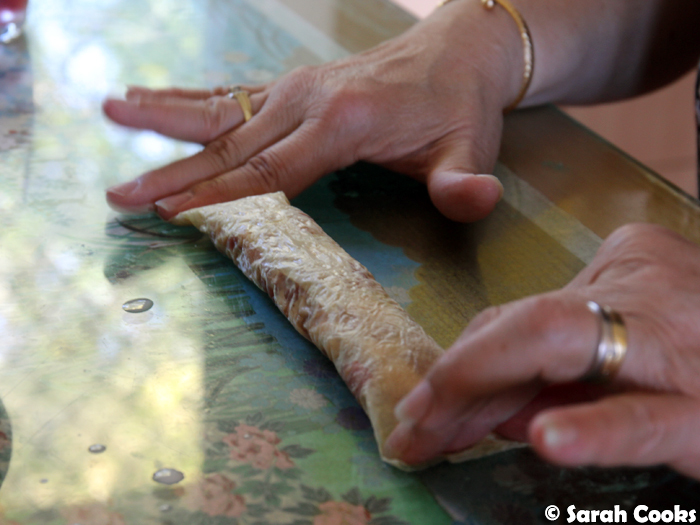 (Dip the cutter in flour to prevent the dough from sticking). Transfer the hearts to the lined baking tray. Bake for 8-12 minutes, or until lightly golden and cooked through. Allow to cool slightly on the tray before transferring the biscuits to a wire rack to cool. 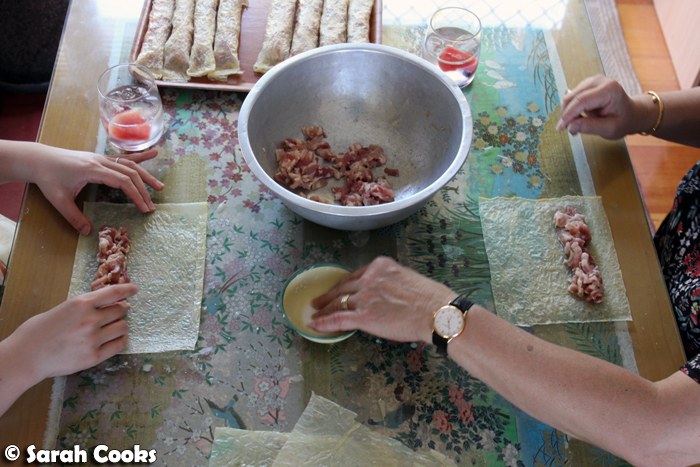 Continue rolling, cutting, and baking the remaining dough until it is all used up. Allow to cool completely before filling with icing. To make the icing... if you are using freeze-dried strawberries, place them in a small food processor and process until powder. Set aside. 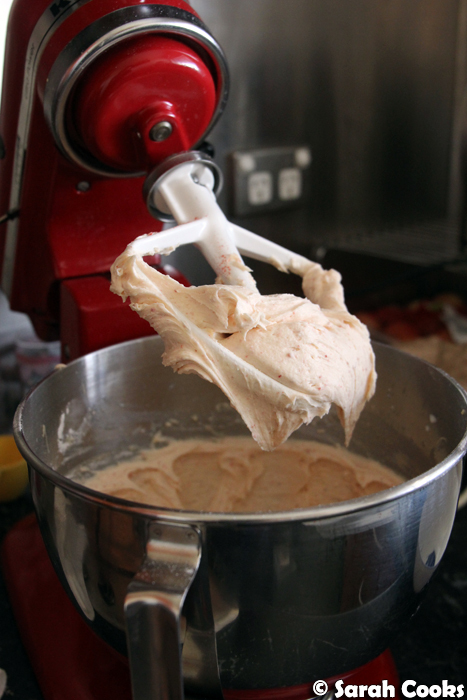 Beat the butter in a stand mixer until light and fluffy, approximately 5 minutes. Add the milk and beat until combined. Add the strawberry powder and icing sugar, and beat until evenly combined and fluffy. Add a good pinch of salt and beat in. 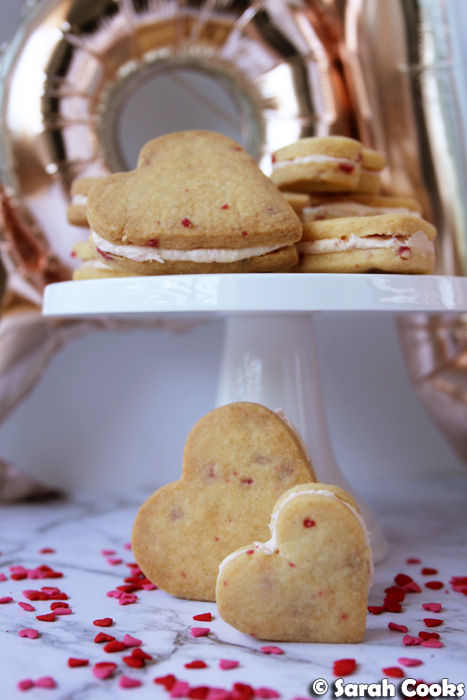 To assemble the hearts, spread a heaped spoonful of the frosting onto a heart cookie, then sandwich with another heart. Continue until all the biscuits are done. Makes approx. 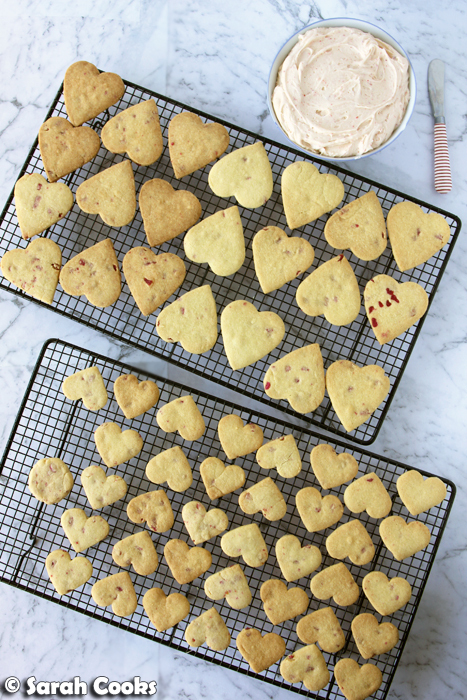 24 biscuit sandwich hearts, depending on the size of your cutters. Cheesy Tex-Mex deliciousness today! 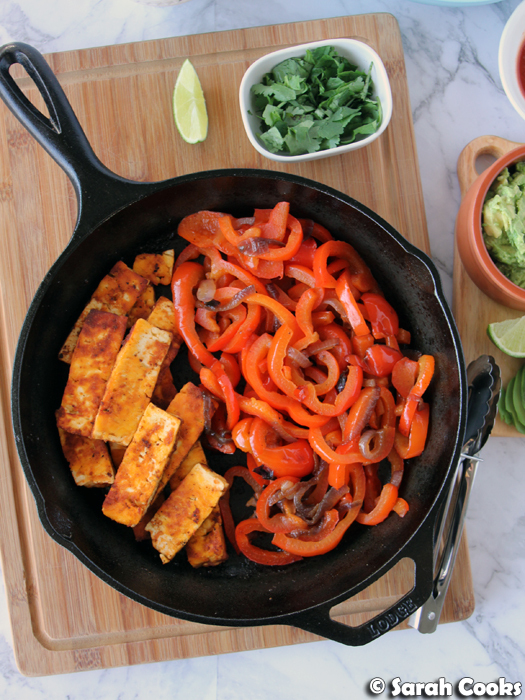 Crispy chipotle-chilli-coated halloumi fingers, served as fajitas, with sautéed capsicums and onions and warm flour tortillas, plus as many accompaniments as you fancy! 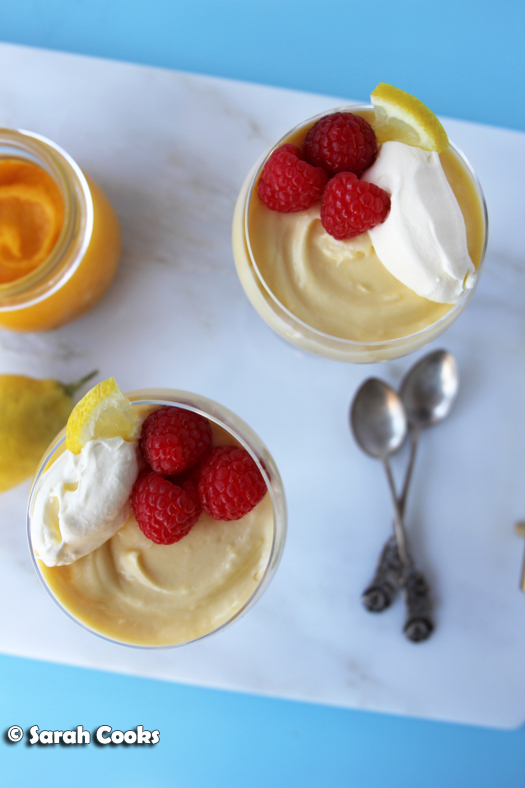 It's fun and easy and tasty, all made with simple supermarket ingredients, and definitely doable on a weeknight! I often scroll through Pinterest when I'm bored - saving ideas for weeknight meals, brunch parties, cakes to bake and more. I'm still not entirely sure how it works, but I do know that my feed is full of sprightly American food blogs (vegan! 3-ingredients! amazing! ), OTT grazing boards, and for some reason, wedding ideas, even though I stopped pinning anything to my wedding board months ago. 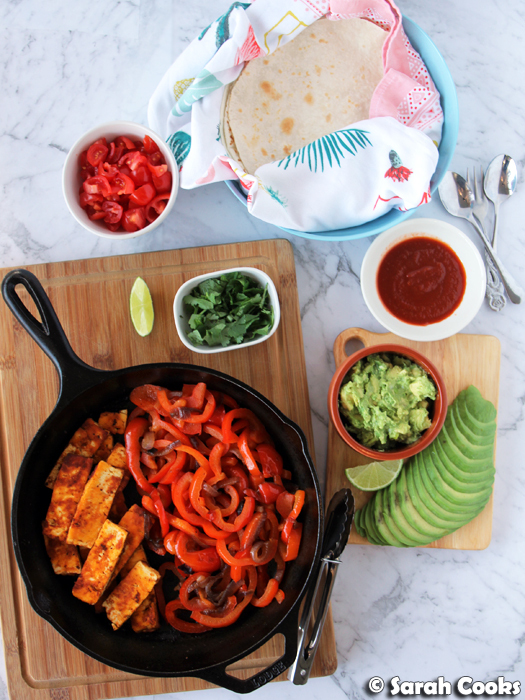 I don't often go from Pinterest directly to the kitchen, but when I saw halloumi fajitas pop up in my feed, I thought they were a brilliant idea. I knew I needed them in my life, and quick! Now, whilst I saw this idea on Pinterest, I made the fajitas my own way. I sliced a block of halloumi into long strips, then marinated it in some garlic-infused olive oil, lime juice, cumin, and chipotle sauce. I'd impulse-bought a bottle of chipotle sauce at the supermarket a little while back, and was very pleased to find a great way to use it! (FYI it was La Costeña brand, not sponsored, which had a bit of warmth but wasn't crazily hot - in terms of heat levels, I'd say it's similar to a medium Doritos salsa). If you can't find chipotle sauce, I'd suggest using a little smoked paprika and some chilli powder instead, to replicate that addictive hot-smoky flavour. Whilst the halloumi strips were marinating, I sliced and sautéed some capsicums and onions until soft and sweet, and whilst they were cooking down, I prepared the sides. 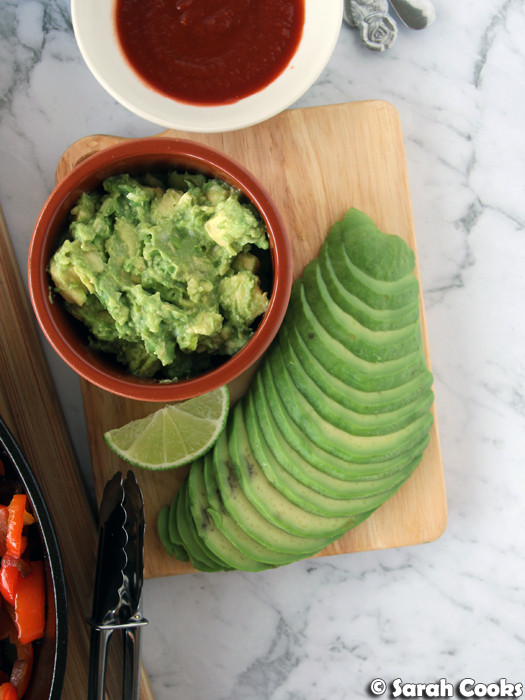 I chose some more of that chipotle sauce, lime wedges, some plain chopped cherry tomatoes, sliced avocados, and a simple guacamole (avocado mashed with salt, lime juice, pepper & some chopped spring onions). Fresh coriander on the side because Sandra HATES coriander. If it were up to me there'd be coriander throughout everything! You could go as simple or as complex as you like with the sides - some form of avocado is non-negotiable for me, and I do love the idea of something fresh and crunchy against the soft capsicums and salty halloumi. Some other ideas: crunchy iceberg lettuce, chopped spring onions, jalapeños, corn, beans... I'd personally avoid sour cream or grated cheese, as we already have the aggressively milky halloumi as the star of the show, but you do you. Just remember that whilst the basic fajitas (halloumi, capsicum strips, tortillas), don't take very long, preparing all the sides can be quite fiddly and take lots of time! I'd suggest picking a couple of simple ones that you and your family really like, rather than going for that whole maximalist vibe with heaps of tiny little dishes. It's just dinner at home, you're not running a Mexican takeaway. Ok, where were we? Right, so once the capsicum strips were cooked and the sides were prepared, I fried the halloumi strips, and heated the tortillas in a separate dry frying pan. I prefer flour tortillas for fajitas and burritos, as I love their soft pliable doughiness. But if you're coeliac, or just really like corn, corn tortillas I'm sure would be fine as well. And we're done! Put everything out and let people assemble their own. I was so impressed with this meal - it was incredible! I loved the salty-squeaky halloumi with the smoky hit of chipotle, plus all the delicious sides wrapped up in flour tortillas. 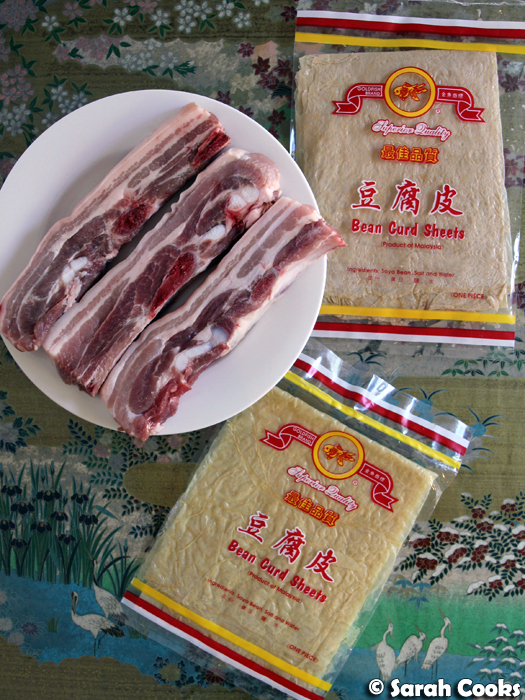 Smoky, salty, spicy, sweet, fresh and crunchy. A tasty vegetarian family meal that can be made quickly and with easily accessible ingredients. I'm definitely adding this to the regular rotation, and I hope you do too! Slice the halloumi into slices approx. 1/2 cm thick. 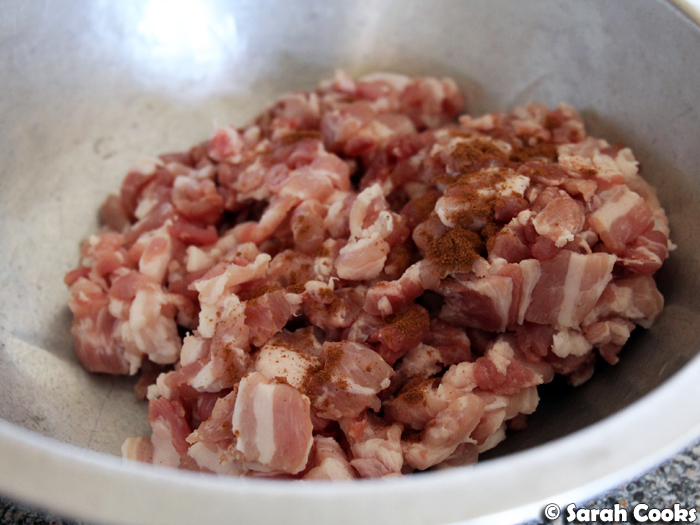 Place into a bowl and add the 1 teaspoon garlic-infused olive oil, chipotle sauce, cumin, oregano and lime juice. Stir to coat the halloumi in the mixture and set aside. Peel the red onion and slice into fine half moons. Core the capsicum, cut in half lengthwise, and then cut into fine slices. Heat some garlic-infused olive oil in a large frying pan. Add the onion and cook for 5 minutes, or until softened. Add the capsicum slices and cook for 10 minutes or so, stirring regularly, or until softened. Remove the onion and capsicum from the pan and set aside in a bowl. Heat a little more oil in the frying pan. Cook the halloumi slices for a couple of minutes each side until golden brown. Meanwhile, heat the tortillas according to packet direction. Arrange the onion-capsicum mixture and the halloumi slices on a serving plate (or back in the frying pan for bonus Instagrammability). 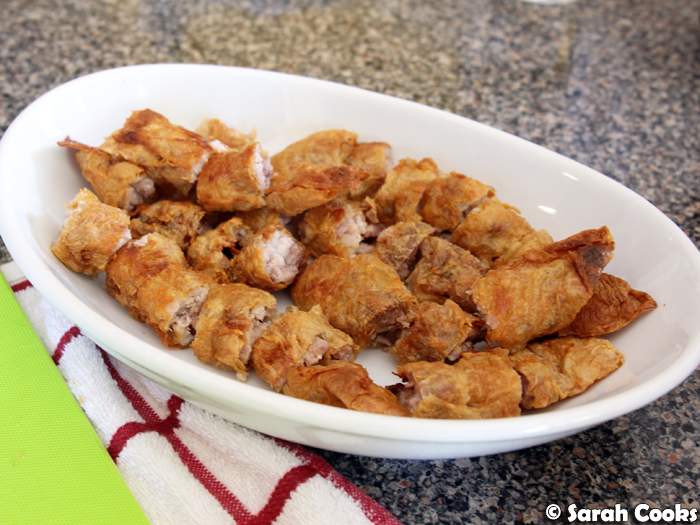 Serve with the tortillas and the accompaniments of your choice. Also check out my other fajita recipes: Beef Fajita Bowls; Chicken Fajita Bowls.